The Outer Banks, OBX, is a vast array of vacation opportunity just waiting for discovery! From Duck all the way to Hatteras travelers are exposed to nothing but the most pristine beauty along the entire stretch of the OBX beaches and banks. Outer Banks, North Carolina is a 200 mile long strip of islands separating the coast of North Carolina and part of Virginia from the Atlantic. The Northern Beaches is a great starting point within easy reach of the other islands. However, you could easily spend your entire vacation in the city of Corolla alone. Offering kayak tours, Jet Ski rentals, surfing lessons, fishing charters, wild horse-finding trips, go-carts, a links-style golf course and tennis courts there is always something the outdoor lifestyle here offers. The attractions will keep you very busy as well. Make sure to visit the lighthouse, nature centers, and restored hunt clubs. Jockey’s Ridge State park is here and is home to the largest sand dunes on the East Coast. The locally owned shops and restaurants are a destination in themselves. The seafood here goes far beyond fish and chips. Roanoke Island and the Dare Mainland are located between the North Carolina mainland and the barrier island beach towns. Great for a day trip from Corolla and pedestrian friendly. You’ll want to visit the many unique shops with art, jewelry and one of a kind items you won’t find anywhere else. Definitely make sure to visit the Elizabethan Gardens in The Fort Raleigh national Historic Site. Its botanical beauty will leave you breathless. The nearby Waterside Theatre is host to the oldest running symphonic drama “The Lost Colony”. It tells the story of the 117 people who sailed to Monteo from Plymouth, England 400 years ago and disappeared completely just two years later. The only clue, the word CROATOAN carved in a post. There's no better place to experience nature and serenity then Hatteras Island. 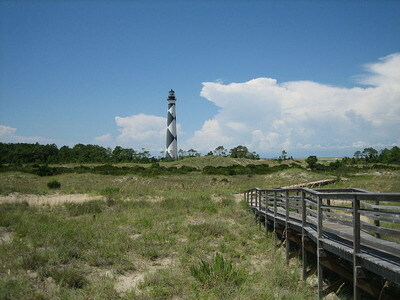 Easily accessible from any of the other islands, pristine Cape Hatteras National Seashore extends for more than 70 miles and covers over 30,000 acres. The first national seashore in the country is dotted with lighthouses and lifesaving stations. Picnic areas and camping stations allow you to get away from it all while still being close to plenty of enticing local restaurants. Summer is the peak tourist season in OBX of course. Fall is a great time to go too. The crowds have thinned but all the unique businesses are still open and the weather is mild. Winter and spring are great if you are looking for an off-season solitary beach experience.For a list of lovely vacation homes for rent.